Check out 10 of the best budget acoustic guitars. 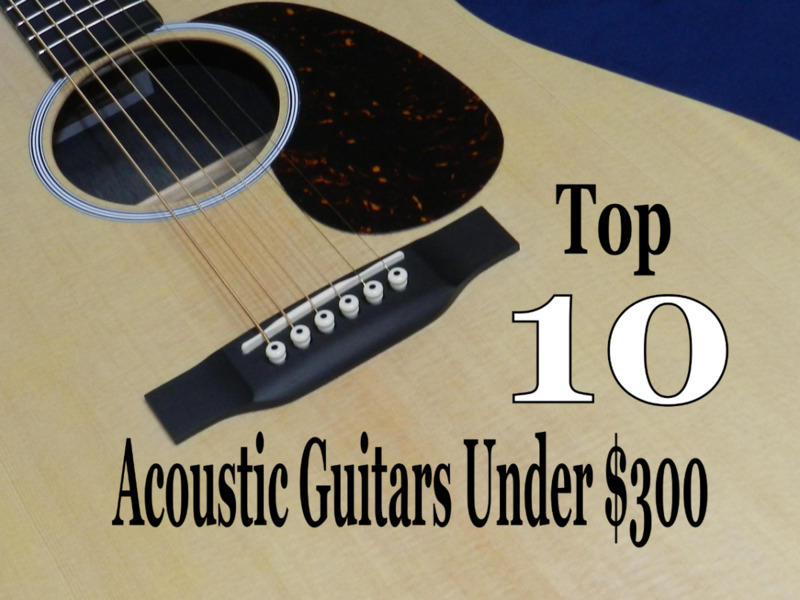 If you’re looking for the best acoustic guitar for the money, $300 will get you a lot more than you think. Top-name brands, the same companies that make expensive guitars for veteran players, feature acoustic guitars that look good, sound great and still fit into your budget. These are quality instruments, good enough for intermediate-level guitarists and even advanced players. But even if you are a beginning player, you’re always better off spending a little more on a guitar made by a well-known manufacturer instead of purchasing some cheap no-name starter guitar from a big-box store. Not only will a better-quality guitar have higher resale value should you decide the instrument is not for you, but you are more likely to be motivated to learn if you are playing a solid instrument. In this article we’ll look at a several different guitars from the best guitar builders in the world that will keep you under your budget and still meet your needs. I’ve researched dozens of acoustics, and narrowed the search down to a few that I would consider well worth their price tags in the $200-$300 range. 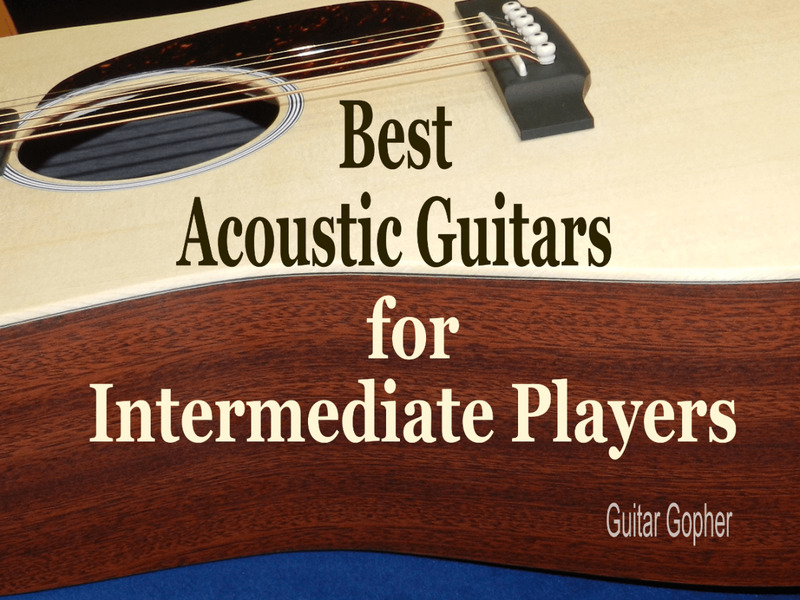 If you are a newbie looking for your first guitar you might want to check out my article on the top acoustic guitars for beginners. Otherwise, your search for your new guitar starts here! Here is the list for quick reference. You can read more about each guitar below. Remember, this list is based on my opinions and experience. I encourage you to do your own research and draw your own conclusions. At the time of this writing all of these guitars could be found for under $300, but be aware that prices can change over time. Be sure to check out the latest specs on any guitar you are interested in as well. Yamaha is one of the most respected instrument makers in the world, specializing in everything from bass guitars to pianos. Their high-end acoustic guitars are exceptional, but they have a lot of offer in the lower price ranges as well. The Yamaha FG Series is among the most popular guitars of all time, and the Yamaha FG830 routinely receives high ratings for its ease of play, great sound and value. 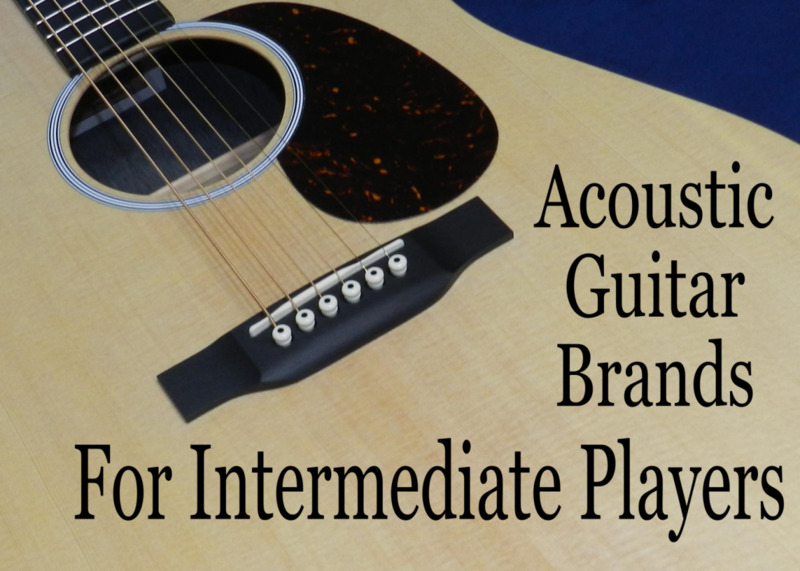 It’s an outstanding guitar for serous beginners or intermediate players, or for a veteran guitarist who would like an extra acoustic guitar around for jamming. There are two reasons this guitar earned the top spot in my review: First, every Yamaha FG Series guitar I’ve ever played sounded way better than it ought to for the price. Second, the FG830 plays really well for a lower-cost guitar. Some cheap, budget guitars tend to have high action, making it tough for beginners to learn the instrument. In fact, when strings are hard to press down, it can be frustrating for players of any skill level. To me, Yamaha acoustics always feel like more expensive guitars when it comes to playability. Yamaha makes some amazing guitars for beginners and intermediate players. I think the FG830 will serve the needs of most mid-level players, but there is another similar instrument you may want to consider. Also check out the FS830, another guitar from Yamaha with a slightly smaller body. Both come in under the $300 mark, and both are excellent beginner-to-intermediate guitars. They feature the same tonewoods and a similar build, the main difference being the body size. I feel like Alvarez is a brand that always gets the short end of the stick. I don’t know why. Maybe because it’s not a name that springs to mind as easily as Martin or Gibson or Taylor, but then again none of those brands make guitars under your budget anyway. But Alvarez does, and they make some darned good ones. The AD60 is part of the Alvarez Artist Series, and there are a few things I really like about this guitar. The first, in a nutshell, is the quality. Yes, all of the instruments in this review are quality guitars, but the AD60 has some appointments you wouldn’t expect such as a real bone nut and pretty binding and inlays. The other thing I like about this guitar is the choice of tonewoods, and the sound. This is a very pretty guitar that sounds amazing. The dreadnought body is a classic acoustic guitar shape and allows an instrument a tremendous amount of sound projection and volume. This combination of the warmth of mahogany and the crispness of spruce gives this guitar beautiful depth and clarity. Epiphone is a guitar company owned by Gibson, and authorized to make Gibson-style guitars for affordable prices. That means some great Gibson designs that were once out of reach for beginner and intermediate-level guitar players are now attainable. It also means some great-quality gear for not a lot of cash. Epiphone is on my list of recommended acoustic guitar brands for mid-level players, and the AJ-220S is a good example of why. This is a guitar with a look and feel of a more expensive instrument, and one of the most affordable guitars in this review. I really love the shape of the AJ-220S, which Epiphone calls their Advanced Jumbo style. It looks amazing, but more importantly it serves to give the guitar deep, strong tone with good articulation. Mahogany is a heavy wood that offers deep, rich tone. I think that’s a good tonewood choice for this body style, and this guitar is a solid option for players looking for that jumbo-type sound without the huge body. The AJ-220 looks and sounds like a classic while keeping your under your $300 budget. Here’s an option a bit off the beaten path. I really like the Fender T-Bucket design, not just because it’s funky, but because I think it serves a certain kind of guitar player perfectly. I’m talking about guitar players who want play an acoustic, but get around a little better on an electric. If that’s you, you might love this guitar. It basically comes down to the shape and feel of the neck, which is a little slicker than what you’d find on a typical acoustic guitar. It’s Fender’s “C” shape, which you also find on electric guitars like the Stratocaster and Telecaster. But make no mistake: This is an acoustic guitar, with a cutaway dreadnought design. In fact, it is an acoustic-electric guitar, which means it has onboard electronics that allow you to plug into an acoustic guitar amp if you so desire. I don’t think the T-Bucket is for everyone, but if you are a guitar player who likes the idea of an acoustic instrument that plays a little more like an electric, it might be right up your alley. You can still play acoustically, but if the opportunity to play in front of a crowd pops up you’ll be prepared. Takamine makes some excellent acoustic guitars at every price point, and they’ve amassed an almost cult-like fan base. Just about every time I’ve written about budget-level acoustic guitar someone asks about them, so I set out to learn a little more so I could provide a decent answer. My conclusion: The GD20 is a solid choice under the $300 mark, from a guitar company that makes some all-around good stuff. I like the cedar top on this instrument. Every guitar in this review so far has had a spruce or maple top, and those are two bright-sounding tonewoods. Cedar, by comparison, is a bit warmer. Players who want a dreadnought-style guitar with a somewhat deeper, more resonant tone may prefer the GD20 over other guitars in this review. Spruce is a classic top tonewood for acoustic guitars, but in my opinion cedar is right up there with it in terms of tonal quality. The sound is a little warmer, but I don’t think that’s a bad thing. Takamine quality is always top notch, and I think the GD20 is worth a look. Washburn has been around since 1883, and has been making quality instruments ever since. Back then it was acoustic guitars, mandolins and banjos. These days, in addition to acoustic guitars, they’re known for awesome basses and signature-model electrics. Washburn makes some great starter acoustics as well are premium models. My favorite in this price range is the Washburn WD10S, another dreadnaught-shaped guitar with a classic tonewood profile. I think Ibanez acoustic guitars are underrated. Sure, the electric guitars and bass guitars are some of the best in the world, but you never hear anyone brag about Ibanez acoustics. Whenever I look at one of their Artwood models I feel like this needs to change. The AW58-NT is a simple but gorgeous dreadnought guitar with a solid Sitka spruce top, rosewood back and sides and mahogany neck. If you know you want a dreadnought-body guitar you should add it to your list of instruments to check out. I’ve become more and more interested in Breedlove guitars ever since one of my local shops started stocking them. They look beautiful, sound great, and are generally fairly affordable. The Discovery Series has a few models that land under our $300 budget, including a basic dreadnought. These guitars use a pinless bridge design, which means there’s no need to drill six holes through the top of the guitar. According to Breedlove, fewer holes mean soundwaves move across the interior of the guitar more evenly without loss of energy. That’s a pretty cool idea. Applause is an Ovation brand, and Ovation is the guitar company responsible for those acoustic-electric instruments with the rounded bowl backs. The material they use is called Lyrachord, and Applause-series guitars use the same stuff. I played an Ovation as my main acoustic at one time, and it was a really nice guitar. I recommend this guitar for players who know they intend to plug into an acoustic guitar amp, as this is where these guitars really excel. The way a guitar is designed plays a big part in the way it sounds. You’ll see a lot of dreadnought-style and similar guitars in this article, and that’s because it offers such a solid compromise between clarity and projection. This shape has been tried and tested over generations of guitar players. Of course the tonewoods influence the sound of an acoustic guitar too. In this article you’ve seen guitars with rosewood backs and sides, and those with mahogany. Rosewood has a deep tone with good bottom, and many players feel it presents more clarity to the notes. Mahogany is warmer, more resonant and maybe a little darker. Whichever you choose is up to your personal preference, and if you are new to the guitar you shouldn't lose any sleep over the difference. You’ll also see some other strange names here, such as nato, oukume and ovangkol. In the guitar world these are often referred to as alternative tonewoods, and they are used as stand-ins for woods like rosewood and mahogany. Unfortunately, some of the tonewoods that are used in guitar construction have become scarce and even endangered (and, therefore, unavailable). A few years back this was pretty worrisome for some guitar players, but the major guitar builders have proven they can make awesome instruments that utilize these alternative woods. In other words, don’t be too concerned when you see these tonewoods mentioned. It helps the environment, and you can still get a great guitar. Remember that this list is based on my opinions and preferences. Again, I really encourage you to get out there are discover what the guitar world has to offer, and form your own opinions. I think this list is a good starting point, but there are dozens of amazing instruments out there. No matter where a guitar landed in my top 10, that fact that it made the list means it is a very good guitar. Good luck, and don't forget this guitar thing is supposed to be fun! Which guitar would you choose? Sounds awesome, Steve! Yamaha really makes some great guitars for the money. I have had the Yamaha fg830 since Christmas and love it. I put Martin silk and steel strings on it when I bought it, but other than that it is original. The action is great and it is very easy to play with a great sound. Breedlove Passport is worthy of a mention. Great tone and volume, easy to play. I own 10 guitars, including to Yamahas and Martins. But of them all, when it comes to the acoustics, I find myself reaching for the Breedlove the most. Good advice, GG. I think Oscar Schmidt makes a quality inexpensive guitar as well, but I don't have much to compare it to. Bought mine for $99 at the Old Town School of Folk Music in Chicago. It's a lefty so I think they were having a hard time selling it. It works for me. Thanks Jay, and thanks for your opinion! Solid recommendation! Get the Yamaha!